SADDLE BROOK, NJ--(Marketwired - May 16, 2014) - Golf tournaments can gratify any number of interests. Whether people arrive to watch their favorite player take first place, or simply rub shoulders with an elite crowd, there's always something to do or someone to watch. And when a tournament as prestigious as The Barclays arrives at a course as steeped in history and excellence as the Ridgewood Country Club, visitors don't want to miss a single swing or bogey, making the Saddle Brook Marriott the hotel of choice for savvy spectators. Located fewer than five miles from the Ridgewood Country Club, the hotel offers a proximity to the tournament that's unmatched by other East Rutherford, NJ hotels. And its accommodations are just as enticing. The on-site Saddle Pub Lounge, for instance, serves as a sophisticated meeting spot where golf fans can relive the day's highlights over signature cocktails and premium wines. Or they can opt for a heartier meal at the recently renovated Saddle Club Restaurant, which stands out from other hotels near the Ridgewood Country Club for its modern American cuisine and stylishly relaxed setting. The Bergen County hotel's style, in fact, complements the established sensibility of The Barclays. Not only does the tournament, scheduled for August 18 to 24, 2014, attract the world's best golfers, but the Ridgewood Country Club bears all the stately grace of an establishment founded in 1890. The club, in fact, is one of the oldest in the country, and the 27-hole golf course is nearly as venerable, dating back to 1929. In addition to its challenging Championship Course, the country club features a Norman Revival clubhouse that is almost as attractive as a well-played game by the likes of Phil Mickelson, a Barclays team member since 2008. At the end of the day, after the bunkers, the bogeys and the holes-in-one, guests can look forward to bedding down in some of the most comfortable rooms among Bergen County hotels. Plush beds, premium movie channels and in-room newspapers make for relaxing stays. Of course, there's room for excitement off the course, too. As one of the most convenient New Jersey hotels near NYC, this property is less than an hour away from the lure of the Big Apple. Golf, after all, can lead to all sorts of unexpected adventures. Offering guests a warm welcome to the East Rutherford area, the Saddle Brook Marriott combines refinement with relaxation in a variety of attractive ways. The two dining options, the Saddle Club Restaurant and Saddle Pub Lounge, put as much emphasis on great food as great experiences, while amenities like the state-of-the-art fitness center and indoor pool create opportunities to stay fit and unwind. 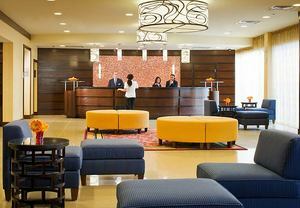 Business travelers are treated to 4,600 square feet of gracious meeting space as well as a convenient business center. And the 241 guest rooms and suites promise comfortable stays for everyone with sumptuous bedding, in-room coffee/tea service, tech-savvy features and a Concierge Level. Whether visitors are staying in the area or traveling to nearby destinations like New York City, the hotel is always a pleasure to return to. With 500 hotels and resorts in nearly 60 countries around the world, Marriott Hotels is evolving travel through every aspect of the guest's stay, enabling the next generation to Travel Brilliantly. Boldly transforming itself for mobile and global travelers who blend work and play, Marriott leads the industry with innovations, including the Greatroom, Future of Meetings and Mobile Guest Services that elevates style & design and technology. All Marriott hotels participate in the award winning Marriott Rewards frequent travel program that allows members to earn hotel points or airline miles for every dollar spent during each stay. For more information, visit www.MarriottHotels.com. To join the ongoing Marriott conversation, like us on Facebook (Facebook.com/Marriott) and follow us on Twitter (Twitter.com/Marriott, @Marriott). The Saddle Brook Marriott is the perfect place to stay for golf fans enjoying the Barclays Tournament at the Ridgewood Country Club.